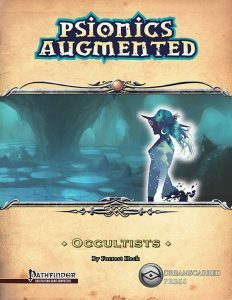 Forrest Heck, with additional design by Kevin Ryan, Adam Boucher and Doug Haworth, delivers a truly impressive pdf; rules-language and design-difficulty-wise, this is one magnificent beast of a pdf. I found myself smiling from ear to ear, time and again, and I really enjoyed many of the options herein. The Containment-focus cheese needs addressing, though if you and your group can agree on not gaming the shattered mind, it otherwise is one amazing monster. The implement schools presented were mostly amazing, though their internal balance is a bit weird. Athanatism’s base touch is too good for an unlimited attack that bypasses everything. Similarly, the use of untyped damage without a clear need strikes me as unnecessary. As written, both athantism and psychokinesis are stronger than the others, to the point where I wouldn’t allow them in most of my games…which is somewhat jarring, considering how well-balanced most of the material herein is. Oh, and Absolute Focus needs to die. It’s a delimiter of the worst sort.